At least three people were killed and two others injured Thursday after a gunman opened fire at a bank headquarters in downtown Cincinnati, officials said. 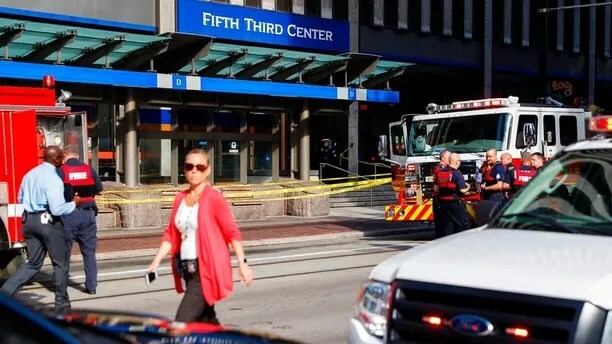 The gunman opened fire at the loading dock and lobby area of the of the Fifth Third Center in the city’s Fountain Square around 9:10 a.m., Cincinnati Police Chief Eliot Isaac said in a news conference. The gunman, who has not been identified, was subsequently killed after he exchanged gunfire with three to four police officers. “[The gunman] was actively shooting at innocent victims, it appears, and our officers were able to kill him and stop the threat,” Cincinnati Mayor John Cranley said. Isaac said there is no additional threat in the area and praised officers for their “quick response.” No officers were injured in the incident. Authorities first reported an “active shooter” situation in Fountain Square at the building, which is the corporate headquarters of the Fifth Third Bank. Videos and photos taken from witnesses showed multiple patrol cars at the scene. One photo showed a bloodied man being taken away on a stretcher. “We did hear a gun shooting from the 29th floor. We could quickly see there was a large police presence and could see them blocking Fountain Square. We knew immediately something was wrong. We’re a bit rattled,” the manager said. A witness told the news station that he thought there was a movie shooting until he saw a women with a gunshot wound being taken away. FBI Cincinnati previously said agents responded to the scene and are assisting police with the situation. Ohio Gov. John Kasich called the shooting “senseless” and commended officials’ swift response.